Gunmen stormed a government building in Afghanistan's eastern city of Jalalabad on Tuesday, taking dozens of hostages after a suicide bomber blew himself up at the entrance gate, officials and witnesses said. At least 15 people were killed and 15 were wounded in the hours-long attack, officials said. Zabihullah Zemarai, a member of the provincial council, says there was first a car bombing — likely an explosion set off by a suicide car bomber — near the city's provincial hospital and health department on Tuesday, followed by gunfire. He says a refugee and repatriation department is also located in the same area of the city so the immediate target wasn't clear. One witness, a passerby named Obaidullah, said Tuesday's attack began when a black car with three occupants pulled up at the entrance to a building used by the department of refugee affairs and a gunman emerged, firing around him. One attacker blew himself up at the gate and two gunmen entered the building, in an area close to shops and government offices, he added. Minutes later, the car blew up, wounding people in the street, Obaidullah said. "We saw several people wounded and helped to carry them away," he added. As security forces cordoned off the area, gunshots and what appeared to be hand grenade explosions could be heard as a cloud of black smoke drifted into the sky. Sohrab Qaderi, a member of the local provincial council, said about 40 people appeared to be caught inside the building, which caught fire early in the attack. "Fighting is over and both attackers have been killed," said Attaullah Khogyani, spokesman for the governor of Nangarhar province. There was no immediate claim of responsibility, though the Taliban issued a statement denying involvement and a spate of deadly attacks on the city in recent weeks has been seen as a show of force by the Daesh militant group. Meanwhile, a roadside bomb which hit a bus in restive western Afghanistan on Tuesday killed at least 11 people and wounded around 40, mostly women and children, officials said. 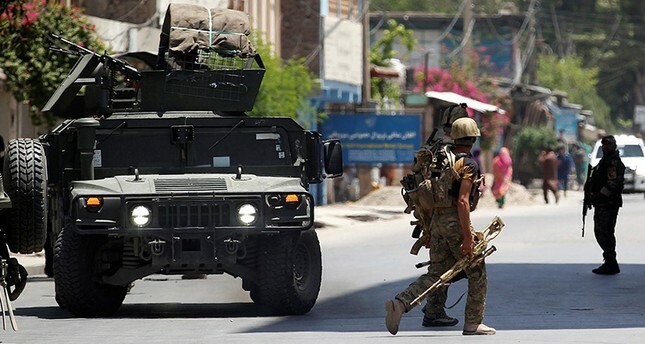 "It was a bomb planted by the Taliban to hit security forces but... it got a passenger bus," Farah provincial police spokesman Muhibullah Muhib told AFP. Afghanistan's largest militant group is very active in the region and often uses improvised explosive devices against government officials and Afghan and foreign forces. The explosion happened as it traveled through Farah's Bala Baluk district at 4:30 a.m., provincial governor's spokesman Naser Mehri told AFP. Around a dozen of the wounded -- mostly members of the Hazara ethnic group who tend to follow Shiite Islam in the Sunni-dominated country -- were taken to hospital in Herat. Among them was Mohammad Zahir, 40, who had been traveling with his newly married daughter to visit relatives in Kabul. "The bus was driving on the main road when I heard a big bang," Zahir told AFP. A photo posted on social media purportedly of the bus showed the vehicle's blackened shell and dozens of men at the scene. Such IEDs caused 877 civilian casualties in the first half of 2018 -- 232 deaths and 645 wounded -- accounting for 17 percent of overall civilian casualties, the latest U.N. figures show. The Taliban has a strong presence across western Afghanistan, particularly in Farah. It launched a major attempt to take over the provincial capital in May, triggering intense fighting with U.S. and Afghan forces.